In the quiet churchyard of St. John the Evangelist, Hurst Green there is a striking obelisk memorial dedicated to one Ikaturo Sugi, a "Japanese Subject" who died in October 1905 at the age of 30. He was an "assistant commissioner in the Chinese Imperial Maritime Customs”. It is thought he had some connection with Stonyhurst College. A corner of an English field that shall be forever Japan. Grade: Moderate. Mainly easy walking but with two sustained ascents. a lane that dips into a dell and climbs up to meet Shire Lane. At the junction turn left into a lane leading to the rear of St John's Church. As you follow the path to the front you pass Sugi's memorial on the right. and continue to a strip of woodland. After a stile and duckboards the path edges along a field to a second stile. and then a fishing hut into the next field. Cross it to metal gates and then turn left in front of them following the hedgerow to another metal gate close to a large boulder. to large farm complex of Cross Gills. to reach a drive leading to Whalley Road. 2. Cross Whalley Road to the drive of Fairfield House. As you near the house (the one on the left of two properties) meditate and pause that it was here far from his native land that Ikaturo Sugi died of TB in 1905 aged 30. The way is right where a grassy track leads to a gate accessing Stonyhurst College. and then the chapel and then finally the impressive main buildings. Keep ahead to reach a lane. on the left and a small barn on the right the road climbs a rise. Just here turn left onto the farm drive of Higher Deer House. 3. After passing between properties keep ahead on a long farm track to reach Higher Deer House. As you approach the farm do not go through the yard but bear left to cross a stile by an outbuilding. Over this keep ahead over a field to a stile in the fence. From here descend steeply into a wooded valley to cross Dean Brook by a wooden bridge. which was built as a Royal Hunting Lodge) Turn left. When the farm road bends right keep ahead on an enclosed path leading into woodland and back to Dean Brook. Cross a wide stone bridge and turn right. 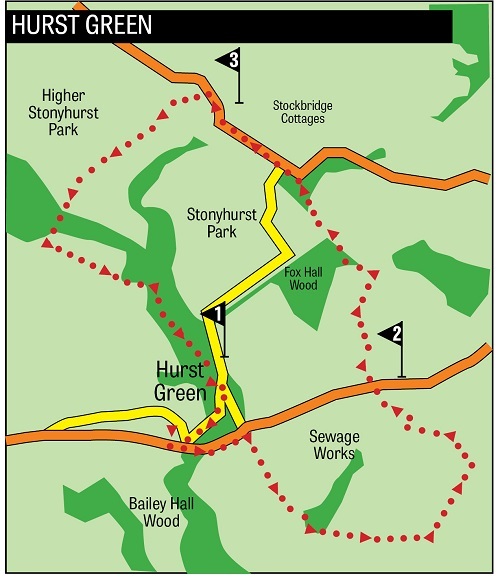 This path soon brings you back to Hurst Green.